Hiromitsu Agatsuma began studying the Tsugaru shamisen at the age of six. Since his early childhood, he frequented in various shamisen competitions and won many prizes, subsequently receiving high recognition in the field of traditional Japanese music.His reputation grew as he ventured out into other genres of music such as jazz and rock. In 2001, he made his major debut with EMI Music Japan with an eponymous album, “AGATSUMA”. It was named the Traditional Japanese Music Album of the Year at the 16th Japan Gold Disc Awards. His second album, “BEAMS ~ AGATSUMA II” released by Domo Records in the US, led him to a successful tour of the East Coast. In 2005, he toured the EU, and won the Japan Gold Disc Award for the second time with “EN”, his sixth album. He has been active not only as a performer but also as a producer, writing scores for TV and theater. In search of the Tsugaru shamisen’s tradition and innovation, with his creation transcending genres, Hiromitsu Agatsuma remains to be a valued asset. He had the privilege of representing Japan and performing at the official dinner for TOKYO 2020 and the 5th Tokyo International Conference on African Development, both hosted by Prime Minister Abe. In 2014, he composed and performed for Ebizo Ichikawa’s Kabuki production. It was unprecedented for a Kabuki stage to have a Tsugaru shamisen. He visits elementary schools all over Japan, teaching the children how fun the Japanese traditional music could be. He also makes a great effort to pass the culture down to the next generation. 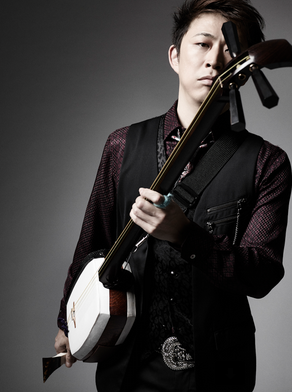 Hiromitsu Agatsuma is a leader of the new generation shamisen players.